Building permits this year for single-family homes are up 49 percent in Kootenai County and up 70 percent in Coeur d’Alene over the same period last year. This may be one of the clearest signs yet the housing market is recovering in the Inland Northwest: A patch of Coeur d’Alene hillside poised for new homes for eight years is finally under construction. Streets, sidewalks and utilities were put in back in 2005, but the 75-lot subdivision has sat unfinished. And that didn’t go unnoticed, given the property faces Interstate 90 just west of the Northwest Boulevard-Ramsey Road exit. The vacant development has been used for rehearsing traffic stops by police officers in training. Student drivers have practiced their turns and parking skills there. And in winter, kids have found the slope an obstacle-free sledding hill. 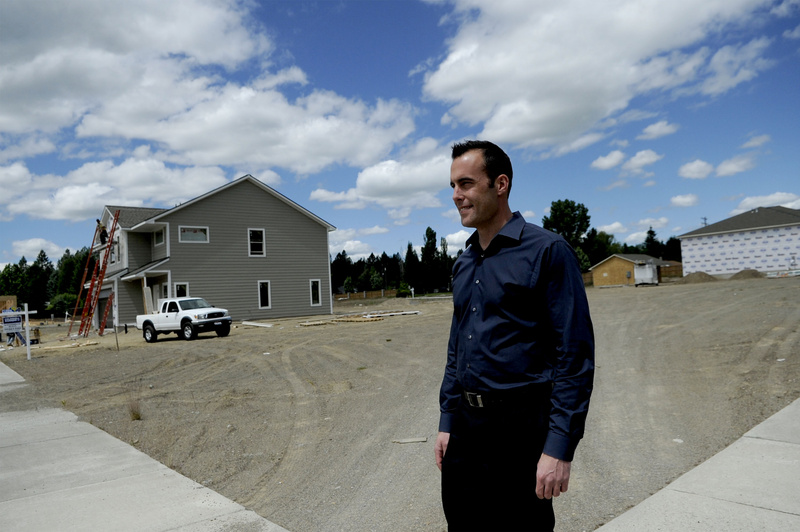 But now a new owner has stepped in, and the first three homes are going up at Orchard Lands, on the north side of I-90 and west of the Coeur d’Alene Public Golf Club. Copper Basin Construction, of Hayden, bought the subdivision at Atlas and Appaloosa roads earlier this year. “We’ve got some good traffic and momentum building,” said Darren Ducote, an associate broker with Coldwell Banker Schneidmiller Realty in Coeur d’Alene. People certainly are noticing the homes going up, Ducote said. “They’ve seen it for eight years as a developed, untouched subdivision where the original developer maintained it so nicely over the years, and everyone just kind of wondered what was going on,” he said. A decade ago, California developer John Brewster had proposed building up to 107 units there – a mix of single-family homes, duplexes and apartments – but was met with opposition from neighbors who thought the plan would add too much traffic on Atlas Road. Although the Coeur d’Alene Planning Commission had approved Brewster’s development proposal, the City Council voted to deny it. He could have moved forward with building apartments and duplexes on the 22-acre site without needing approval from the Planning Commission or City Council, but instead Brewster sat on the subdivision, as did many developers and builders through the lean years of the recession. “And now we’re back to a very limited supply of available lots for construction,” Ducote said. Vacant land sales in North Idaho are up 65 percent over last year, and the number of home sales – nearly 1,000 since the start of the year – is the highest in seven years, according to the Coeur d’Alene Multiple Listing Service. In Kootenai County, sales are up 25 percent over last year, and the average sales price is up 6 percent. The hottest segment of the market is homes priced under $200,000. That accounts for 47 percent of sales this year, the MLS reports. And those homes are selling briskly, Coeur d’Alene Realtor Marshall Mend said. “When it comes on the market, it goes pretty fast,” he said. Improving housing markets elsewhere are again allowing retirees to sell their homes and move to North Idaho, and new jobs in Kootenai County are bringing in more buyers, Mend said. “The market’s still low, even though prices have gone up a little bit. But it’s a great time for buying,” he said. At Orchard Lands, Copper Basin is offering homes starting at around $167,000 but expects most sales will fall between $200,000 and $400,000, Ducote said. One feature the builder anticipates will be popular is a detached guest home – a studio, one-bedroom or two-bedroom – all on one level, he said. “With the amount of baby boomers and elderly people that are getting full-time care, being able to provide a fully functional detached guest house where you could take care of your elderly parents … I think will end up being a huge selling tool for us,” Ducote said.